Last week at our summer camp,the theme for the week was; I Love Animals. The teacher that was running the camp was wonderful and I thank her very much. All of her crafts centered around certain books. This is a great way to create lessons. Books are wonderful inspirations for many things. 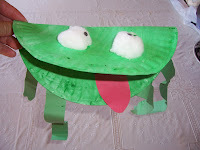 The one day I was there they were making a frog out of a paper plate. I honestly can't remember the book she based the craft on, although I have a good frog book at home that my youngest likes. The book is The Big Wide-Mouthed Frog, by Ana Martín Larrañaga. It's about a frog that travels to discover new animals and what they eat. His last encounter is with a crocodile that likes to eat big wide-mouthed frogs. It's cute. The first thing one has to do is paint the plate green--back and front and allow this to dry. After the plate is dry, fold it in half. Glue two cotton balls to the top outside half for the eyes. She put two small black circles in the cotton to finish the eye, you can do this, or you can use a marker. 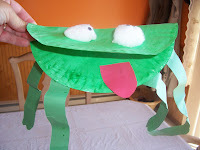 Then glue one edge of the strips of paper to the bottom outside half for the frogs legs. These will dangle down like long legs. Finally, glue the red tongue inside of the frog sticking out a bit for effect. 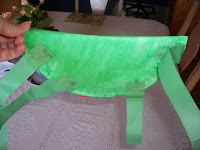 Now don't fret if you don't have green paint, or paper--make a frog to your liking. If you think about it, there are many different colored frogs around the world. Only have markers, color your plate with them, have blue paint, make a blue frog, have an artist, make a frog of many different colors.--have fun with it. Many thanks again to the I Love Animals teacher for allowing me to share this with everyone. I'll inspire my curious companion, my niece, to play this frog. We do not get to see green frog here, but still there are some frogs. I think she will love it.